I am making some new power cords (what the heck, its an experiment) from Belden 19364 cable , known for being an improvement from standard. At the same time, it made me think about the internal wiring for AC, i am using inside the Maya amps. Maybe its not ideal...and maybe i can improve it. I run my AC from the back of amplifier where the IEC input is. Then, run both N and F wires along the center of the chassis to the front Switch (it is a dual pole switch). Then to the transformers. Now : should these wires be shielded ? Should they be thicker than 1.5mm2? Should i get a relay instead for the front switch and keep AC at the back ? Opinions are welcome...sorry for the toy schematic. The wire size depends on the mains fuse you use. The wire must be rated higher than the fuse rating. Twisted pair make a good emi reduction strategy. Twist the fuse to switch wiring. Twist the switch to transformer wiring. Keep the loop areas at the terminations as small as possible. Note the open loop on the input wiring near the open loop in the mains wiring. Using a single fuse for two transformer means upto ten times longer rupture time when abuse occurs. It is safer to fuse each transformer separately. Close rated fusing is even safer, since it is another factor of 10 faster than the big fuse you need when you don't use a soft start. You have a lot of wiring coming into that bolted connection just along from the mains input. What are they? There should be the PE wire and nothing else. Last edited by AndrewT; 18th December 2017 at 02:55 PM. I only have 1 FUSE, and that is in the IEC connector. It is rated at 10A, 250V slow blow. I have a PSAUDIO PPP coming soon, that has a soft start so no worries there. The main AC wiring to and from switch is twisted. Safety rules in power cables. So, is this Belden 19364 an approved one? A 10A mains fuse on a 230Vac supply is enormous. It will pass 10A indefinitely during a fault, it will pass 20A for many seconds and maybe as long as half an hour during a fault. What VA rating are your transformers? these 4 connections are possibly wrong. Check with AKSA where the currents flow. What you must NOT do is force the returning current to take a long route to return to it's source. The return route should be alongside the Flow route for that current. None of these 4 wires has a Flow route starting at the Chassis/Enclosure. Last edited by AndrewT; 19th December 2017 at 02:42 PM. The inlet fuse in the IEC should be much smaller amperage and fast blow. With Hugh's module construction you do need to connect the chassis earth spade to the "earth" bolt on the chassis. There is no reason to connect the rca to the "earth" bolt. Be sure to follow connection advices with the Belden cable, especially with regards the drain wire. I suspect you are already aware of that. It is easy to confuse this earthing and it's crucial to get it right. I've spent years trying to perfect a repeatable earth system on my amps and I'm pretty sure this is the best I've done yet. 1. RCA input HOT to module, and BRAID to Sig Earth on the module too, NOT to the chassis/star earth on the enclosure. 2. IEC power earth to chassis/star earth on the enclosure. 3. 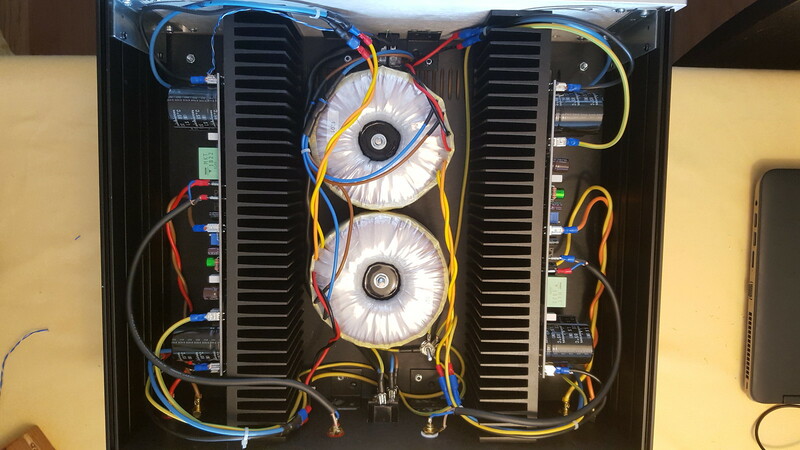 Power earth wire from modules to chassis/star earth on the enclosure. If you have an electrostatic wire on the toroids, you may also connect them to chassis/star earth on the enclosure. Do NOT connect RCA signal input GROUND to the chassis/star. This will create hum and noise. Be sure that the ground of the RCA does NOT connect to the enclosure on the enclosure panel. This will also create hum and noise. 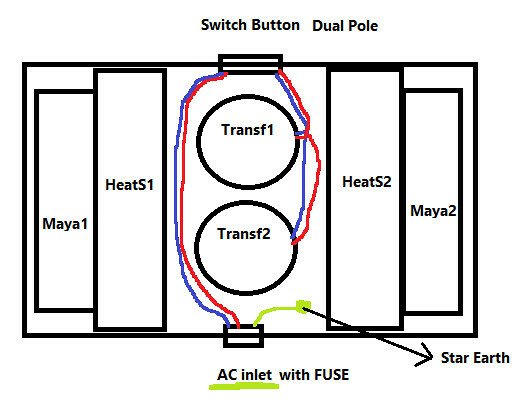 Twist ALL AC lines tightly so that they do not radiate AC noise into the modules. A standard fast blow 10A on the IEC input socket will accommodate two 220/240Vac 300VA toroids with ease. At full operation, the amp will be pulling just under 3A from the mains, but mostly it's well under an amp in use. A 10A fast blow is good protection in this situation. This regime works very well and does not require a slow turn on circuit. The 300VA toroid current surge at switchoff is around 11 times the max current (more than 13A EACH) but it persists for only two cycles, which is just 40mS, and this is not sufficient to blow the 10A fast blow fuse. The actual peak is only a few mS in fact, it is not consistent along the 40mS turn on event. Thanks to AndrewT, Stvnharr and Scott Joplin. Last edited by AKSA; 20th December 2017 at 12:39 AM. Ok about the twisting, i will check. Nobody recommended to use shielded AC twisted wire from IEC to switch. I would assume this shielding would benefit then ac noise redutction. These EARTH connections are on the Maya modules and Hugh clearly says to connect them to Star Earth. 100% sure here. I do not use a coax cable for RCA input wire. I use a shielded twisted pair. So i have 2 conductors, one for HOT and one for NEUTRAL. Plus i have the copper shielding that i connect to EARTH GROUND at the source end (wire from rca input end). This shielded copper is NOT connected to anything besides the start earth bolt. This is purely for shielding ac noise and i confirmed it WORKS. By the way the Belden 19364 is a very well known and respectable AC wire.